This gold tone Celtic pin or tie tack features a Trinity knot with green enamel accents. This Celtic tie tack, like all the Irish made jewelry at The Irish Gift House, is nickel free and hypoallergenic. This gold tone Celtic pin features green enamel accenting on the Trinity knot design measures 1/2” wide x 1/2" tall. 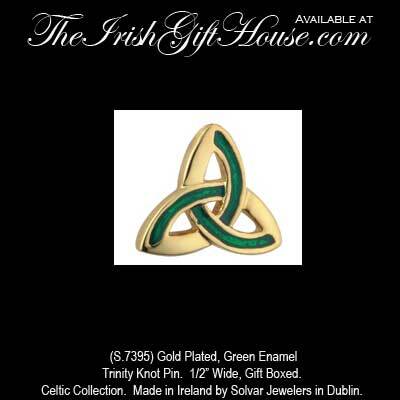 The Irish pin is suitable as a tie tack or as a lapel pin and is gift boxed with a Celtic knot history card that is complements of The Irish Gift House. The Celtic tie tack is made by Solvar Jewelry in Dublin, Ireland.